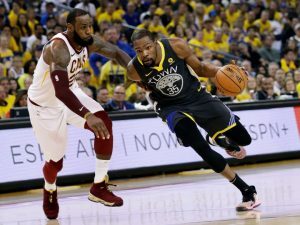 Golden State Warriors dominated again over Cleveland Cavaliers in the second game of the NBA finals with a score of 122-103, which was played at the home of the Warriors at Oracle Arena in Oakland. Warriors now hold a 2-0 lead over Cavaliers. 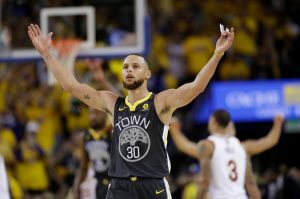 History was made by Stephen Curry in this game as he scored 9 3-pointers out of 17 and was also man of the match with a total score of 33 points to his name. Stephen Curry also broke the record of Celtic Star Ray Allen who scored 8 3-pointers in the second game of the finals against Lakers in 2010. On the other hand, Lebron James performance was admirable as he scored 29 points, 9 rebounds and 13 assists to his teammates, but still they lost the match. Warriors looked confident as they lead Cavaliers with 9 points in just eight minutes. At this point the score of Warriors Vs Cavaliers was 15-6. Then George Hill scored a 3-pointer followed by Lebron’s lay up. But still Warriors were leading by 5 points. After that, Stephen Curry from Warriors missed a three-pointer, although Warriors were leading Cavaliers by 7 points with only 11 minutes remaining in the first quarter. After five minutes, Lebron assisted Kevin Love for a jumper while on the other hand, Jordan Bell from Warriors alley-oops Draymond Green’s pass. Warriors were scoring at a fast pace than Cavaliers with Stephen Curry and Shaun Livingston scoring with only 3 minutes left in the first quarter. At this point the score was Warriors Vs Cavaliers 30-24. The 1st quarter ended with the scores: Warriors vs Cavaliers 32-28. The second quarter started with Kevin Durant from Warriors scoring a mid-range jumper just after a minute. This was not enough for Durant as he scored a 3-pointer after 2 minutes. After that, Cavaliers took a timeout. The scores now were Warriors Vs Cavaliers 39-30. George Hill scored a three pointer after the break followed up by Kevin Love’s 3-pointer. Cavaliers were recovering points to come back in the game. Warriors on seeing this scored 7 points together including Stephen Curry’s 3-pointer and Shaun’s two straight dunks. Warriors were now leading Cavaliers with a good lead of 13 points. After the Cavaliers got possession, George Hill scored on two free throws followed by Lebron James layup. Cavaliers were cutting the lead down but Stephen Curry again scored a hilarious 3-pointer to end Cavaliers run. 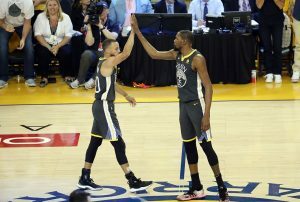 After that, Kevin Durant scored 2 points followed up by Stephen Curry’s 3-pointer which extended the lead for the Golden State Warriors. At this point the scores now were Warriors Vs Cavaliers 59-44. Lebron then gets a basket and the 2nd quarter was finished with Warriors still leading by 13 points. Tristan Thompson from Cavaliers makes a layup followed by Kevin Love’s three-pointer. After that, Kevin Durant scored on a free throw and a three-pointer. But Kevin Love again scored a 3-pointer for Cavaliers immediately after Durant. The scores now were Warriors Vs Cavaliers 66-56. Warriors took a timeout after George Hill from Cavaliers and Klay Thompson from Warriors both scored a three-pointer. After that, Kevin Love scored on a free throw followed by Lebron James layup. On the other hand, Thompson gave Warriors a much-needed three pointer and then Cavaliers took a timeout. The scores now were Warriors Vs Cavaliers 85-77. Warriors were extending their lead as soon as Cavaliers came closer enough. The Cavaliers played at their best and tried to catch up but it wasn’t easy to do so. With only six minutes remaining in the 3rd quarter, David West from Warriors scored a three-pointer while on the other hand, Kyle Korver scored on a free-throw when he was fouled by Bell. The third quarter ended with Warrior maintaining a lead scores of: 90-80. Lebron scored a three-pointer at the start of the 4th quarter. But Stephen Curry shocked everyone when he scored two straight three-pointers after which Cavaliers called a timeout. Kevin Love scored a lay-up after the timeout but still the Warriors were leading by 13 points. The scores now were Warriors 100-87 Cavaliers. 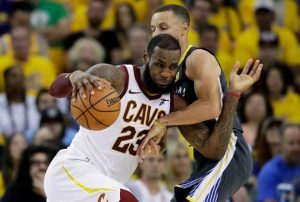 Lebron James then scored a layup but Stephen Curry responded him by a three-pointer as the shot clock was about to expire. After Cavaliers scored on both the free throws, Stephen Curry again hits a crazy three-pointer from long range. The scores now were Warriors 109-93 Cavaliers. Warriors kept on scoring for 8 minutes including Stephen Curry’s record breaking 9th 3-pointer of the match and Cavaliers were stopped at 93. After a while, Jose Calderon from Cavaliers scored a layup responded by Zaza Pachulia who scored on two free throws. At last, the whistle blew and the 4th quarter ended. The final score was Warriors 122-103 Cavaliers. Stephen Curry scored the most points (33) in the game while Lebron James finished with 29 points to his name. Join allsportspk as soon as you can, so that you can see the Game 3 between Warriors vs Cavaliers on 7th June.